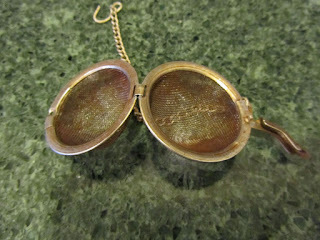 If you drink loose-leaf tea, you know the frustrations of a tea ball whose clasp will not stay closed. You fill your aging tea ball with tea leaves, close the clasp, drop it into a mug, and then pour water over it.You can't dunk the tea ball up and down, as it comes open too easily. And even when the tea ball is just resting at the bottom of the mug of water, the ball manages to open itself, just enough to allow leaves to float out and into your tea. Yes, this is my frustration, with not just one tea ball, but with both of my tea balls. I tried using pliers to tighten the clasp, to no avail. I considered buying a new tea ball. 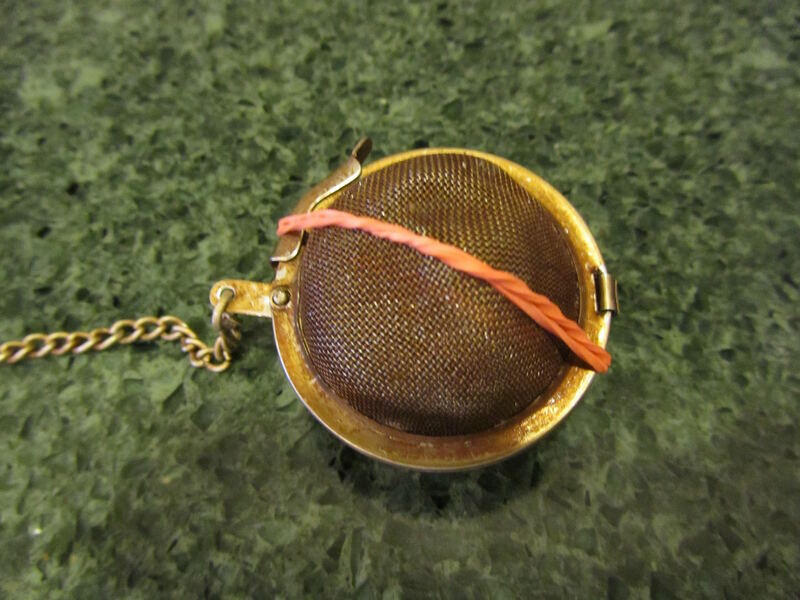 But it bothered me that 2 tea balls that otherwise work for steeping tea, would no longer be used, simply because of a loose clasp. My rather crude fix involves a rubber band from a bundle of radishes. The rubber band must be somewhat food-safe, if it's been holding my produce together for several days, right? Anyways, after I fill my tea ball with loose-leaf tea, I wrap a rubber band around the outside, holding the whole thing together. Found my fix. It's not pretty, but it does the job! Couldn't you give the clasp a little tiny squeeze with a plyers? Just a small little pinch? My tea ball comes in two parts and I have to screw it together but there are no threads, only a raised bump. I also have a single serve tea ball teaspoon that is spring loaded so pinch it open, fill it, then let go. 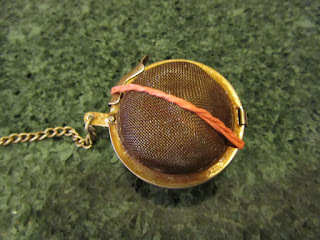 My youngest now uses a tea infuser with large tea leaves purchased at tea stores. That is way too expensive for me but college kids love that stuff. I tried several times, with pliers, and couldn't get the clasp to tighten. So, a rubber band it shall have to be. I have thought about using rubber bands in various cooking situations, but wondered if the hot water would cause some of the flavor of the band to go into the food/drink. From what you say, that's not a problem. Next time I need something like a rubber band, I'll try it. Thanks for figuring it out for me. As far as I could tell, no flavor from the rubber band. Of course, this could be different if I was actually boiling something with the rubber band. But for making a cup of tea, this worked. Good use for your tea ball, with the seasonings. Have a great day, Ushuaia! Good for you making pot holders:) I have some things for Christmas started. I have 23 pairs of socks bought after Christmas at 90% off. I paid 20 cents a pair not sure what I putting with these still thinking on it. I made like a gallon of vanilla so I will add this to a kitchen basket, in small bottles already purchased.I will make vanilla sugar with the used beans. Maybe add that to a basket with scone mix. I have a lot of baking decorations. I think I will make up some homemade mixes. The soup mix is a good idea. I will put that in my back pocket for now. I have made some homemade earrings. I got the supplies a wile back. The men are harder so they probably will get food gifts. Feel better, Patti! I hope you can get a good night's sleep. Your Christmas plans are really shaping up! Good job, Patti! Men are hard to find homemade gifts for. I do think they appreciate edible gifts, though. cute potholder post. Sorry have had a migraine since Friday.